The Ebac CS60 Dehumidifier is a heavy duty, medium capacity unit suitable for use in small to medium sized areas of commercial, industrial and domestic premises. The dehumidifier is rugged enough to withstand the demands of harsh environments and rough handling and has the high quality and sophisticated components to perform reliably over extended periods in demanding conditions of temperature and humidity. 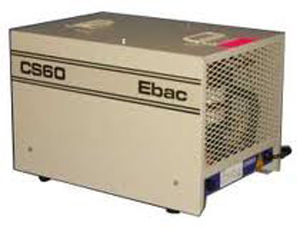 The Ebac CS60 Dehumidifier is equipped for the worst conditions and has the best components to deal with them. It incorporates a high efficiency rotary compressor which makes it more effective in extreme environments and also contributes to its energy efficiency. Like all the other working parts the compressor is a robust and reliable unit to ensure low maintenance and to minimise costly down-time. These qualities explain why this unit is popular with users who need a dehumidifier for remote locations where the unit may have to work without attention for considerable periods, such as pumping stations. The Ebac CS60 dehumidifier is as tough on the outside as the mechanical parts on the inside. Mounted on a steel chassis and enclosed in a heavy gauge steel casing the CS60 can withstand the accidental impacts and heavy handling which are inevitable at industrial sites. For even greater protection the casing has a resilient epoxy powder coating to provide the most durable unit possible. The Ebac CS60 is designed for small to medium sized areas up to a maximum of 1500 sq ft (manufacturer's recommendation). The water extraction rate of this unit is 56 pints per day, measured at the conditions prescribed by the Association of Home Appliance Manufacturers (AHAM) of 80°F and 60% relative humidity. These standard conditions are intended to provide a fair basis for comparison between dehumidifiers and tend to be more applicable to room dehumidifiers. Conditions in many industrial and commercial locations are much more severe and under such conditions the Ebac CS60 dehumidifier can extract up to 120 pints of water per day, making it a very powerful unit. Despite this power the Ebac CS60 is a remarkably compact dehumidifier with external dimensions of only 14 x 20 x 14 inches. This suits it well for location in areas where space is tight, including crawlspaces which are amongst the few areas of a home where conditions can be as severe as on industrial sites. Naturally a unit as strongly built and protected as the Ebac CS60 dehumidifier is no light-weight, tipping the scales at 63lb. It is, nevertheless, portable and has a pair of military-style carrying handles which conveniently fold away when not in use. The manageable weight and small size of the Ebac CS60 suit it well for transport between sites, even in small vehicles, if this is part of the user's requirements. If permanent installation is required, however, the CS60 is configured for ducted installation so is flexible enough for a wide variety of applications. A key requirement of a dehumidifier in tough environments is the capacity for low temperature operation. The Ebac CS60 dehumidifier excels in this area due to the hot gas defrost feature incorporated within it. As most readers of this page will be aware ice formation on the coils of a dehumidifier can seriously degrade performance. Without counter action this can start at temperatures as high as 65°F. With its highly effective active defrosting system this unit can operate effectively and efficiently down to an extremely low 33°F. Automatic humidity control is essential when a dehumidifier is inaccessible and the Ebac CS60 incorporates an adjustable humidistat for this purpose. Once the chosen level of relative humidity has been programmed the unit monitors the moisture level and cycles on and off as required to maintain the pre-set level of dryness. This not only maintains a constant level of relative humidity but, by preventing unnecessary operation of the machine, saves energy too. Naturally the Ebac CS60 is equipped for continuous drainage, by means of a gravity feed. This means, of course, that a drain or other outlet must be close by and on the same level as the dehumidifier. Unfortunately a condensate pump is not part of the package although a separate pump may be obtained if the discharge point is inconveniently high, or distant from the dehumidifier. While the focus of this review has been the industrial or commercial applications of the CS60 it has many attractions for domestic users in crawlspaces and basements. If an area is particularly cold and/or wet a room dehumidifier is very much a second-best choice and the Ebac CS60 dehumidifier is has all the characteristics required in a crawlspace, including a very low height of only 14 inches. The principal disadvantage is the cost although it is comparable to that of crawlspace dehumidifiers produced by other manufacturers.